As we’ve discussed before, call to actions are absolutely crucial when it comes to SMS marketing campaign composition. If you’re new to this mobile communication tactic, you might struggle when trying to develop your own unique phrases. 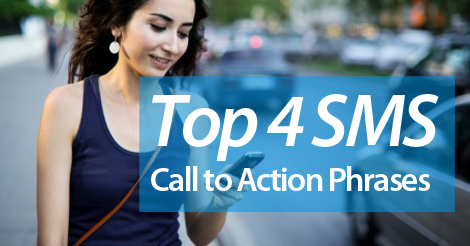 For this reason alone, we decided to list out some of our favorite call to action phrases, as well as the most common usage cases. Now, keep in mind, without a call to action, your offer redemption will be slim to none. Keep it simple and to the point. This will easily yield the most results, which in the end, encourages long term business growth. Don’t include three call to actions in one text. Similarly, don’t make your call to action one, long run on sentence. This call to action specifically applies to in store promotions. We work with thousands of restaurant owners who take advantage of this phrase when firing out a limited time mobile offer. Usually partnered with show this text, stop in is yet another in store applicable call to action. This is a great call to action to use when running a text to win contest. If you’re taking advantage of our email capture feature or birthday rewards functionality, you’ll become quite familiar with this call to action phrase. Partner up with the best SMS marketing provider, Slicktext.com. Want to learn more? Reach out to our dedicated support staff at 1.800.688.6290, or head over to the pricing page and sign up for a free plan. We offer educational resources that empower even the newest SMS user to succeed.